It all started in 2006, when 19 Rhode Island sheep farmers decided to find a way to turn waste wool into profit, and help them continue to run successful, local farm operations. Rhode Island sheep farmers were having difficulty selling their wool. The decline of wool textile mills in New England and low wool prices had turned much ram wool into a nuisance rather than a product. As a result, excess raw wool is often stored on the farm, used as compost, buried or disposed of at local landfills. Rhode Island sheep producers approached RI RC&D with a request to investigate options for the local use of their raw wool. RI RC&D facilitated the formation of a project steering committee to move the venture forward in 2006. Committee members include representatives from the Rhode Island Sheep Cooperative, RI Resource Conservation and Development Council, URI, USDA-NRCS and private citizens. The Committee's project goal was to produce wool blankets by the fall of each year to have for sale during the holiday season. Each year, wool is collected from local sheep growers and it is shipped to South Carolina for cleaning and processing before returning to nearby Massachusetts for spinning and weaving. The woven wool then returns home to RI for fulling, napping, cutting, and finishing. Since then, over 125 producers have contributed to the production of the successful Rhody Warm brand of quality wool blankets. The long term goal of this project is to develop a process to produce quality wool blankets to bring more income to farmers. Ultimately, we hope that more wool producers will participate in the project and serve to promote the sustainability of local agriculture and agriculture products. If you have sheep and would like to contribute wool to the project, we welcome you to join the Co-operative. Proceeds from the Rhody Warm Blanket Project have helped provide funding for local 4-H sheep programs, Scholarships for our youth-members, donations to other local organizations and increased programs offered by the RI Sheep Co-operative. 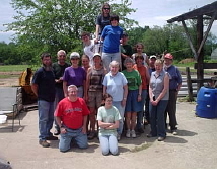 In 2016, the RI Sheep Cooperative offered their first Shepherds' Forum, which was a huge success with adult and youth participants from all over southern New England. With the proceeds of the sale of the Rhody Warm Blankets, another Southern New England Shepherds' Forum will be held in 2018.